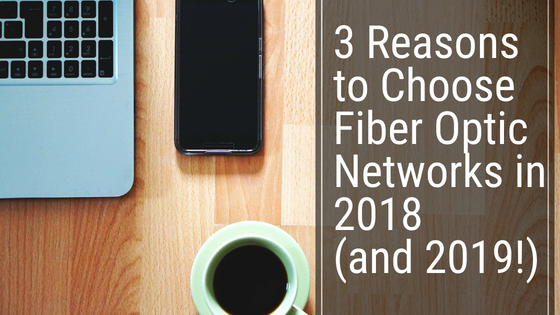 If fiber optic cables are the future of connection, you can bet that fiber optic networks are the future of connectivity. It’s time to make a switch to the most reliable network available today. As technology shifts, businesses need to be prepared to have a network that supports current and future technology, workload, and processes. Looking for a few reasons to commit? We’ve got you covered! Just as science fiction wax lyrical about lightspeed and fast travel, companies today are striving to reach the same speeds in their network. Even if your knowledge of science is limited, odds are you know that light travels pretty darn fast. In fact, light can travel up to an incredible 186,282 miles per second! Imagine reaching those speeds at work? Fiber optic networks consist of cabling that’s made of long, glass strands that transmit light over far distances. With fiber optic networks, your team will have the ability to reach high speeds consistently throughout the day! If you’re not already using the cloud, trust us, it’s coming. You cannot beat the convenience that using cloud programs provides your business, in and out of the office. Remote working is becoming the norm for many businesses. With the cloud, employees can access important documents from the comfort and convenience of their own home. Fiber optic networks provide faster access to the cloud thanks to improved connectivity. This will become more and more beneficial in 2018, 2019 and beyond. In fact, Gartner projects that the cloud services market will grow 21.4 percent this year. Stay ahead of the curve with a network that will support your future. Long distance relationships often get a bad rap, and for good reason. Thankfully, there are some instances where long distance means positive things! Unlike copper cables whose signals worsen over distance, fiber optic cables thrive! Thanks to low attenuation, fiber optic networks have a strong, consistent connection regardless of distance. Copper cables that are stretched over far distance have a poor connection and low speeds. Ditch the slow speeds and unreliability of copper and choose a network you can depend on, rain or shine. Imagine high speeds that aren’t hindered by large files or an extreme amount of data. Well, with fiber optic cables, that dream is a reality. Fiber optic networks provide bandwidth that can withstand a high amount of data without affecting those high speeds you’ve come to know and love. Today, businesses are transferring large bulks of data. A simple dropbox file can easily be upwards of several gigs. You shouldn’t be punished for transferring data that’s essential to your business. Choose a network that supports the level of bandwidth you need without sacrificing speed. Interested? CableLAN Products can help!